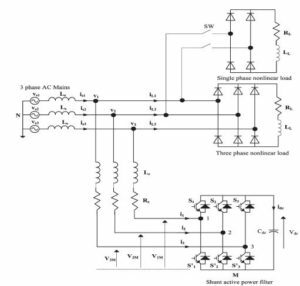 This paper presents a nonlinear control technique for a three-phase shunt active power filter (SAPF). The method provides compensation for reactive, unbalanced, and harmonic load current components. A proportional–integral (PI) control law is derived through linearization of the inherently nonlinear SAPF system model, so that the tasks of current control dynamics and dc capacitor voltage dynamics become decoupled. This decoupling allows us to control the SAPF output currents and the dc bus voltage independently of each other, thereby providing either one of these decoupled subsystems a dynamic response that significantly slower than that of the other. 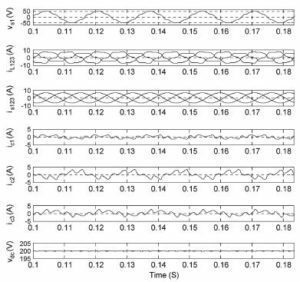 To overcome the drawbacks of the conventional method, a computational control delay compensation method, which delaylessly and accurately generates the SAPF reference currents, is proposed. The first step is to extract the SAPF reference currents from the sensed nonlinear load currents by applying the synchronous reference frame method, where a three-phase diode bridge rectifier with R–L load is taken as the nonlinear load, and then, the reference currents are modified, so that the delay will be compensated. The converter, which is controlled by the described control strategy, guarantees balanced overall supply currents, unity displacement power factor, and reduced harmonic load currents in the common coupling point. 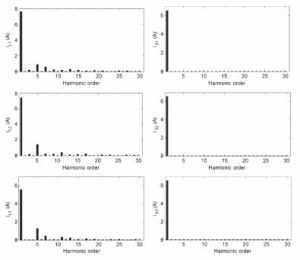 Various simulation and experimental results demonstrate the high performance of the nonlinear controller. Fig. 1. Basic circuit of SAPF. Fig. 2. Steady-state response of the SAPF. Fig. 3. Spectrum of phase 1. (a) Load current. (b) Source current after compensation. Fig. 4. Dynamic response of SAPF under varying distorted nonlinear load conditions. Fig. 5. Steady-state response of SAPF with nonlinear load unbalances. Fig. 6. Spectrum of load currents and source currents after compensation for asymmetrical load conditions. 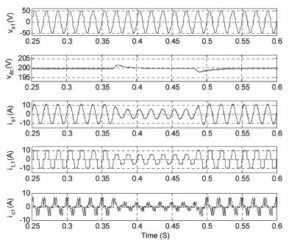 The nonlinear control algorithm of an SAPF has been implemented to enhance its response for compensation of nonactive load currents. The nonlinear control technique of the SAPF has been designed, which is based on two inner current loops and an outer dc bus voltage regulator loop. It addition to good performance in both steady-state and transient operations. Simulation and experimental results have validated the nonlinear control approach of the SAPF. It has been shown that the system has 1.5 cycles for the outer voltage loop and 0.5 cycles for the inner current loop and is able to keep the THD of the supply current below the limits specified by the IEEE- 519 standard. The obtained results have demonstrated the high performance of the SAPF. 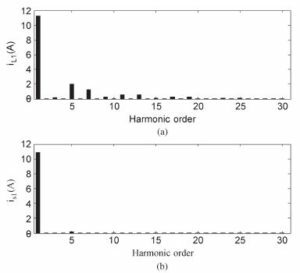 Senini and P. J. Wolfs, “Hybrid active filter for harmonically unbalanced three phase three wire railway traction loads,” IEEE Trans. Power Electron., vol. 15, no. 4, pp. 702–710, Jul. 2000. 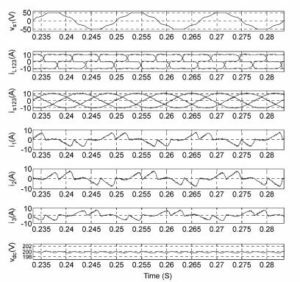 Rahmani, K. Al-Haddad, H. Y. Kanaan, and B. Singh, “Implementation and simulation of a modified PWM with two current control techniques applied to a single-phase shunt hybrid power filter,” Proc. Inst. Elect. Eng.—Electr. Power Appl., vol. 153, no. 3, pp. 317–326, May 2006. Singh, V. Verma, and J. Solanki, “Neural network-based selective compensation of current quality problems in distribution system,” IEEE Trans. Ind. Electron., vol. 54, no. 1, pp. 53–60, Feb. 2007. R. Lin and C. H. Huang, “Implementation of a three-phase capacitor clamped active power filter under unbalanced condition,” IEEE Trans. Ind. Electron., vol. 53, no. 5, pp. 1621–1630, Oct. 2006. Grino, R. Cardoner, R. Costa-Castello, and E. Fossas, “Digital repetitive control of a three-phase four-wire shunt active filter,” IEEE Trans. Ind. Electron., vol. 54, no. 3, pp. 1495–1503, Jun. 2007.